New regulations from the Ministry of Transport, introduced in March, require all commercial fishing vessels from 7.5m to 24m, operating outside of enclosed waters, to carry a Category 1, automatically-deployed, float-free EPIRB (Emergency Position Indicating Radio Beacon). “Ocean Signal’s SafeSea E100 and E100G EPIRBs are the perfect solution,” says L&B’s Bob Fassio. 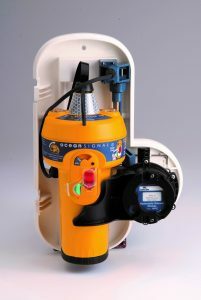 “When used with a SafeSea ARH-100 float free housing, they will activate and deploy automatically if submerged in water. The E100G’s robust internal GPS accurately fixes the exact location of the vessel in distress to within 110 to 120 metres. The coordinates are then transmitted via a 406MHz distress signal to search and rescue authorities, with a 121.5MHz homing signal further guiding searchers to the position. Like all Ocean Signal beacons, the SafeSea E100 and E100G float-free EPIRBs are compatible with the next-generation MEOSAR satellites. This ensures they will offer near instantaneous signal detection and transmission, enabled by the global transponders and upgraded ground-station components. Although the deadline for installation of the float-free EPIRBs is January 1, 2019, Bob Fassio says he believes many operators will choose to fit them well before that. To enable fishing boat operators to install a float-free EPIRB as soon as possible, L&B has ensured they have plenty of SafeSea E100 and E100G float-free EPIRBs in stock and available for immediate delivery. Ocean Signal’s SafeSea float-free EPIRBs are now available nationwide through Lusty & Blundell’s network of leading marine dealers.